In the early 1900s, people found work in an entirely new industry: the typewriter, one of many technologies that signaled the dawn of a new era. During this time, typewritten correspondence was becoming a thing, and demand for machines was ever-increasing. J.S. Wade was one of the many finding employment in this new field, landing a job at Remington in Denver, Colorado. Apart from a single letter in my collection, I have no other information about J.S. Wade, but his letter speaks volumes. 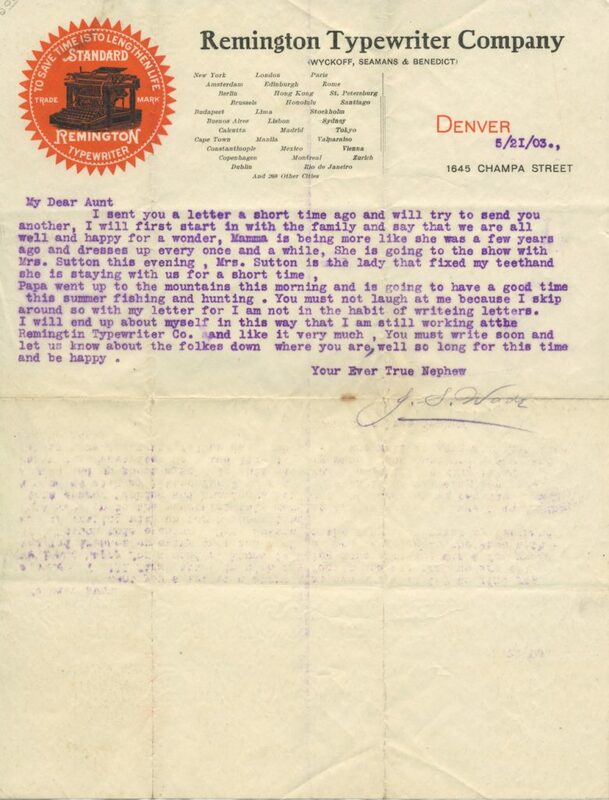 The letter, generally uncorrected, continues: “We are all well and happy.” He notes that Mamma intends to watch a show with Mrs. Sutton, and Papa intends to go fishing and hunting for the summer. Delightfully, J.S. employs a mere two periods in the letter, preferring commas where else periods should be employed. At the end of the letter, he even “corrects” his punctuation, converting a much-needed period into a comma. It is interesting to note that instead of a lower-case L for the number 1, he employes the capital “I” — the early standard Remington’s did not have 1’s — which is evident in the date. How many people preferred the Roman numeral I, not knowing that the lower-case L was intended for that use? Seems even Remington employees did not know this. To download, right click and select, “Save as…”, or to view larger image, click on image itself. That’s neat. I wonder what his job at Remington was? Probably pretty low down in the hierarchy, I imagine — but did an ordinary worker have access to official stationery? I’m intrigued by the purple ink, reminiscent of elementary school mimeograph duplication. Could this be an ink-based “carbon” copy? I had no idea Remington had a Denver location. When I looked up the street address on Google Maps, there is only one building suggestive of the time period. Still in the business district, though. This was clearly from a young man in a job not requiring a lot of education. All kinds of clues, in there. Surely, anyone with much schooling would know how to use commas and periods. On the other hand, I see no corrections or strike-overs. So, we will not critique him on misspelling his employer’s name, as the I and the O are next to each other on a QWERTY keyboard. I was wondering about the color of the ink, too. Carbon would leave a bit of a “glow” around the text. Perhaps that color ink was used in the office for a particular task?